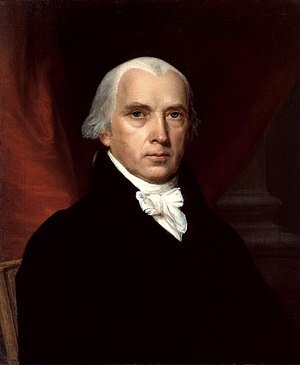 James Madison, Jr. (16 March [O.S. 5 March] 1751–28 June 1836) was an American statesman and political theorist. He was the fourth President of the United States (1809–1817) and is hailed as the “Father of the Constitution” for being the primary author of the United States Constitution and the author of the United States Bill of Rights. Along with Alexander Hamilton and John Jay, he is one of the authors of the Federalist Papers (1788), which became the most influential explanation and defense of the Constitution after its publication. Madison's most distinctive belief as a political theorist was the principle of divided power. Madison believed that "parchment barriers" were not sufficient to protect the rights of citizens. Power must be divided, both between federal and state governments (federalism), and within the federal government (checks and balances) to protect individual rights from the tyranny of the majority.